Via Matt Yglesias, here’s an interesting BLS study about how many hours people say they work vs. how many hours they actually work. This is actually sort of a pet topic of mine. My experience is solely with white-collar offices, but for years I noticed that my colleagues routinely overestimated how many hours they worked. As it happened, I frequently worked a little late and a little on weekends, so I had a good sense of just how many people were in the building after 6 pm or on Saturdays. Answer: virtually no one. You could fire a cannon through the place and not risk hitting anyone. And yet, people routinely thought they worked something like 50 hours a week. But guess what? 50 hours a week is actually a lot. It means working until 7 pm every night. Or it means working until 6 pm every night and then working a solid chunk of hours on Saturday. And there just weren’t many people who did that. (Nor was much work being done at home. You’ll just have to trust me on that.) The numbers are even worse for 60 hours a week. You’d have to work 10-hour days routinely and a good chunk of hours on both weekend days. There are people who do this, but honestly, not all that many. 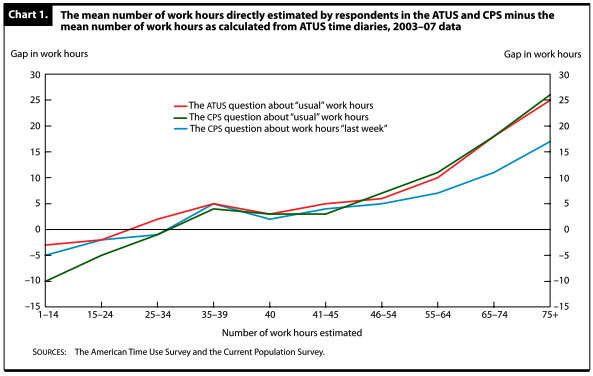 As you can see, people who report working 50 hours a week typically overestimate by about 5 hours. My take on this has always been simple. If you stay late a couple of days a week, it feels like a strain. You feel like you’ve really put in the hours. And since, in the modern work environment, 50 hours sounds only moderately hardworking (60 hours is the lower bound for real workaholics), that’s what you convince yourself you worked that week. But the truth is that two or three late nights actually adds up to maybe 45 hours or so. At the high end it gets even worse: 75 hours is 10-11 hours every day, or 12-13 hours six days a week. Not many people really do that. But if you work 60 hours a week, the truth is that you’re working a helluva lot of hours. That’s 10-hour days six days a week. But since 60 hours is just your basic workaholic level, and you feel like you’re doing more than basic workaholic hours, you figure you must really be working 70 or 80 hours a week. There are some people who really do work these kinds of hours, of course. And there are people who work multiple jobs and put in lots of hours. But among your typical hardworking office types, bragging on your hours comes with the territory. As with other kinds of bragging, however, you should take it with a grain of salt.